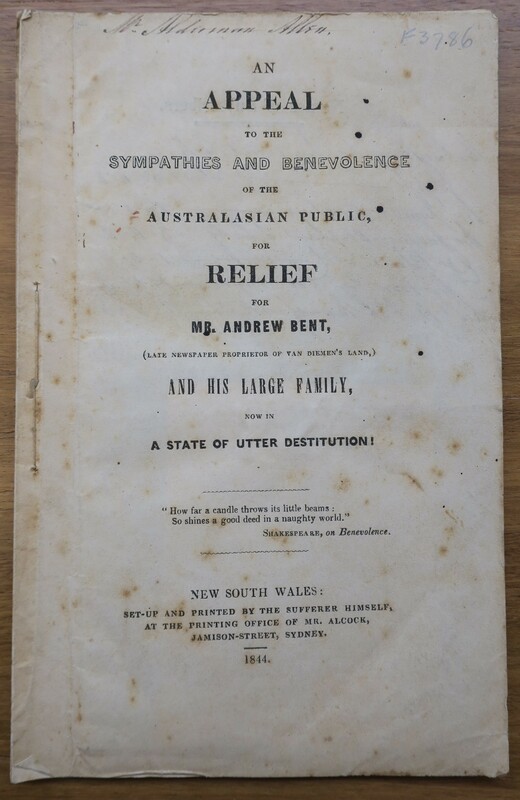 An Appeal to the Sympathies and Benevolence of the Australasian Public: For Relief for Mr. Andrew Bent, (Late Newspaper Proprietor of Van Diemen’s Land) and His Large Family, Now in a State of Utter Destitution! New South Wales: Set-up and printed by the Sufferer himself, at the Printing Office of Mr. Alcock, Jamison-street, Sydney. 1844. The pamphlet was distributed in Sydney, VDL and Port Phillip in conjunction with an intensive newspaper advertising campaign. Bent sought donations to extricate himself and his family from dire financial difficulties. After a couple of disastrous years at Kempsey Bent returned to Sydney and engaged in a fruitless search for employment. His wife Mary and the younger children were still on the McLeay River frontier. The pamphlet gives interesting details of Bent’s career and includes numerous newspaper extracts from the past and testimonials from some of his Sydney acquaintances. The initial appeal was not as successful as Bent hoped and it was recommenced on a better organized footing early in 1845. By mid-December 1846 Mary was back in Sydney, although mortally ill, and the subscription list was wound up. The most interesting copy, bibliographically, is the Mitchell Library copy which came from the papers of Sir George Arthur. This copy was first sent to W. A. Duncan, former editor of the Australasian Chronicle. It was returned for reuse and then sent to Arthur although it is not clear when. Both names are written on the title page, on the yellow paper wrapper and one of the circulars. The copy has been marked up for emphasis by Bent (probably for Arthur’s benefit) and includes a number of additional printed documents. It is not clear whether some or all of these were included in the pamphlet as sent to Duncan, found loose in Arthur’s papers, or acquired separately by D. S. Mitchell and tipped in later. This copy also includes two small hand-folded envelopes for donations, also obviously recycled from first use. ‘Expressions of Regret.’ Undated but after 16 July 1844. At foot: BENT, TYPO. 1 leaf (verso blank.) Inserted in Arthur’s copy. ‘Andrew Bent’ (article reprinted from Colonial Observer 21 Nov. 1844.) 4 p. Inserted in Arthur’s copy. ‘Additional Observations of the Australian and Tasmanian Press.’ (Undated. 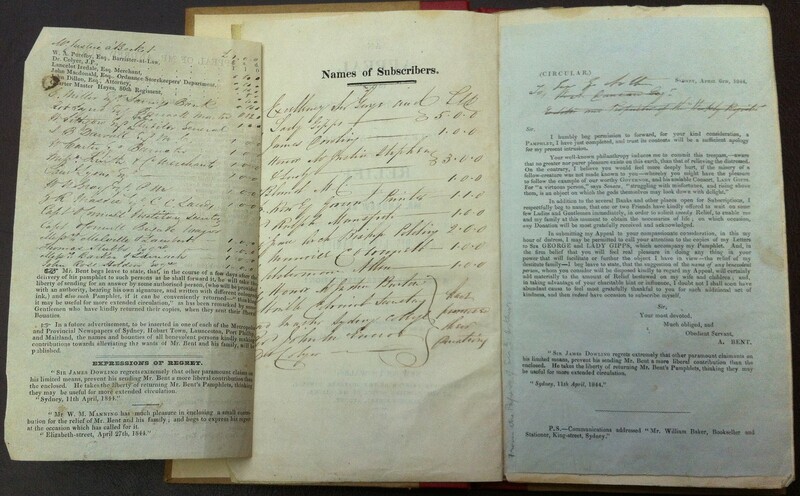 Extracts cover 27 Apr 1844 to 29 Jan 1845.) 1 leaf pasted onto inside back wrapper of Arthur’s copy.